Ensured enough sleep, rest ,fluid&sodium the night before race. Didn’t want to risk for a cramp or fatigue. Gears all dah ready.. Race baju dah gantung. Bike already at Major Kalam‘s house.So, senang sket. Race morning, parked at his house, and cycled to transition. Not many people, or was it the area which makes me feel the crowd lesser ? silap.. there were as many people..but they were all over the place..toilet, aerobic session, warm up. Hehhehhehe.. the most havoc and fun place you wanna watch the ‘macam-macam’s of athletes would be before a start of a popular marathon/run. Name it ; KLIM (Kuala Lumpur Internationl Marathon), GE30k (Great Eastern Pacesetters 30k), Powerman , and of course, PD triathlon! Ahakzz.. with the posing in front of the camera, catching up with fellow runner/triathletes, stretching, focusing with the the mp3/ipod earphone in ur ears , the 3rd trip to the loo,the long queue, etc ! See, its kinda a celebration already, just without the food and drinks unless you’re considering your endurance drinks and Power Gels ! Anyway, i was kinda ‘late’ this time.. Even worse, since its my last MUDS this year (and so was the case for you DUers out there who took part! ), got nervous a bit lah.. but toilet 1 time only..and the rest was blur case..stretching lebih kurang, chit chat with my friends.. huhuh.. grand reunion for MUDS.. Mariana,Nurina,Zabil,Azam,Goh,Ngae,Bad,Esmen,Su Ee were all there that morning for the race! sapa lagi.. ha,ramai lagi lah!! Missing in action : Masita, Aini, Ros, Steph ! Oii mana you all pigi ?? 😦 of course, they have their own reasons tak dapat datang.. and oohh.. i forgot, Farid and his non identical twin brother was there too, together with Shazali and Doc Azman. Man took part in the relay. Run 1 : Okay.missjewelz getting more nervous.. heavy breathing sets in as they count down to gun off.. i tak tau how to type the sound for bunyi horn.. so there –> *hornnnnnnnnnn*.. clicked start on the chrono mode on the watch..and ran ! We had to run around the admin/lecture building, pass the pool,the round about, and loop the route 3 times.. thats a 4.0km run.. Tried to look for a target..ended up running behind Zabil most time. I think we reached T1 nearly same time.. Run was flat . kinda biskut kering gitu.. u just run and no need to think about hills or having to think how long more..coz the 4km quickly passed by and before you could realize it, its already T1.. ran takde perasaan.. hahaha.. jahat tak.. i was just scared of the cycle route la.. Chan said got lubang here and there..and of course,many humps ! T1 : A swift 1.. manage to do it quickly.. keep up the improvement jewelz ! Again, i found myself behind Zabil, but not for long.. he was too fast for me. But anyway, I was focused to overtake the guys in front of me. 1 at a time..I call that the immediate goal..hahaha.. and also, target the hills..i’ve cycled once with nurina along the cycle route a few months ago (or was it last year). We wanted to run up bukit besi, so we cycled to the guard post near bukit besi(Iron Hill) entrance, parked our bikes there, and ran up.. So basically, i knew it was a challenge to keep up and maintain to a speed coz there were simply so many junctions, roundabouts, dgn u-turn nyer.., apa lagi..humps, small stones at the road side..obstacles la tuh.. so nak laju sangat takut ada yang melayang.. and cycling a less slower means more effort at climbs (by the way, it wasn’t as hilly as UM/UKM)..
We had to do 3 loops of 6.8km for cycle.. total 20k.. no ladies sayurd me during bike. and Mariana? haha..she chopped and sayured and goreng everyone long ago at the 1st run lah !! T2 : 1st time someone acknowledging me thru the speakers as i arrived at T2. Not many bikes at the bike stand/rack! huhuh.. semangat !!! And oso, 1st time had sooo many pics of myself at transition.. anyway, gotta run !!! Another 3 loops to run !! I slowed down at the water station.. never pampered myself so much before during such a short run !! ayaaa.. every loop drank the chilled, yummy and sweet endurance drink, let the fluid trickle down my throat slowly..hahahah..mengada betol la.. defeats the purpose of racing.. can’t so mengada2 if u wanna race okay.. unless you’re racing just to finish it, which of course serves as an accomplisment for you, then , i think its okay.. There were 2 guys ahead of me during the last 2 laps.. kept a close distance behind them.. they main sayur-sayur.. ahh.. i just ran .. last 300m open up the stride, and sprinted pass them towards finish line. Anyway, I was sooo relieved to finish..it was sooooo hot !!! If you’re read part 1, i already mentioned, heat was comparable to PD.. simply hot..
Habis ! pheww…. took my bike , and terus head for the shower !! balik rumah Major, terus ask for Ribena ..COLD ribena.. eee…ngade nyerrr…. ttak pe.. race sprint lagi memenatkan dari endurance race..ahahah.. no, really.. anyway, drank till i was blotted.. took my shower..kemas2 barang..then, phone call.. ala..sapa plak dah nie.. owh, Syabaan.. my strong cyclist friend and junior.. ‘kak,dia orang dah banyak kali panggil akak..datang kat kaunter nieh..’ translated >> sis, someone is looking for you.. report at the counter..! .. and again, another phone call, this time from Major Kalam himself..okay !! 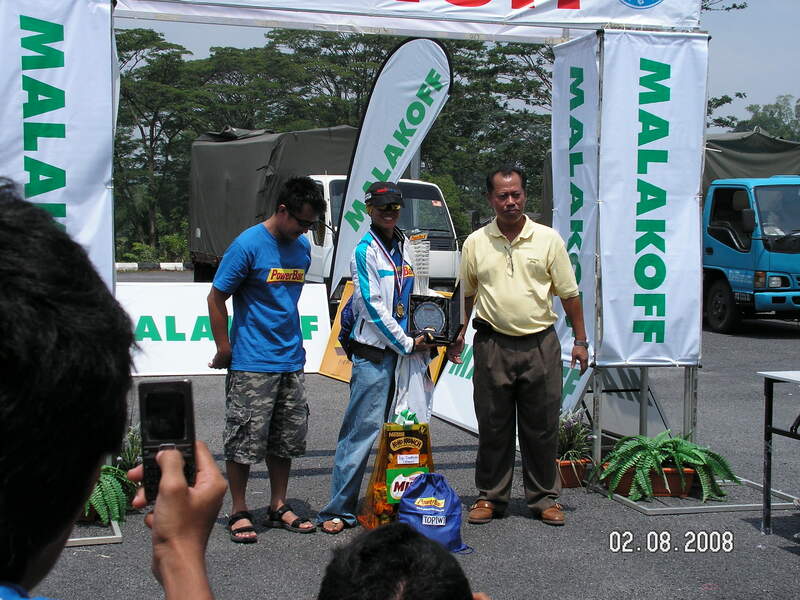 Quickly cycled to the transition area..parked the bike..
Owh.. this reporter looking for me..wa.. never got interviewed before.. 1 lady from Kosmo, and another guy from utusan who also took part in the race in the media category..
Prize giving..wa…this time the prize giving was grand.. so many prizes and a few awards given away to the winners ! 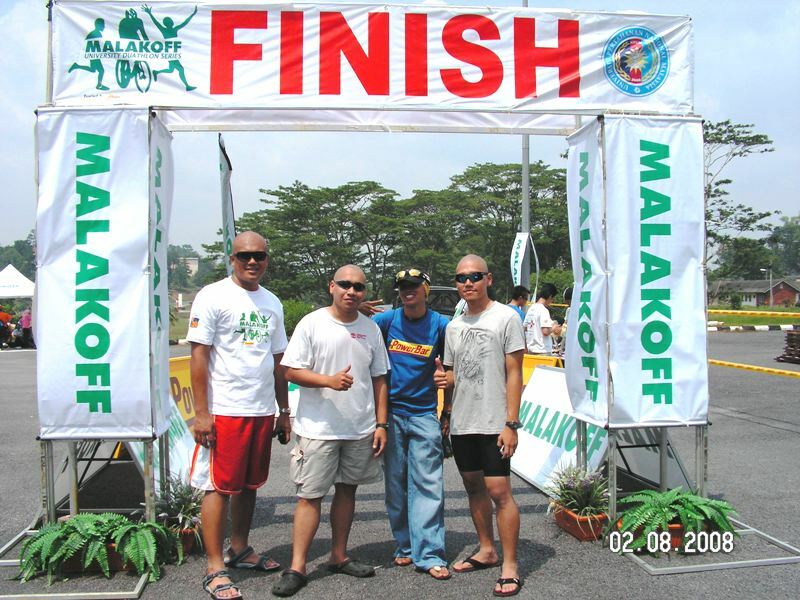 For the pics do check out MUDS blog at http://muds2008.blogspot.com and also the official results for all legs at http://duathlonseries.com.my . So close yet so far. Race time and results are valued by both serious and fun racers/athletes ! Brapa time? How did you do ? Sub 3 ? Sub 2 ? hahaha.. when i race, its usually the immediate goal that i focus on..and also trying to ‘stick to plans’.. by the time official results are out.. its either case 1 : aya… how come i didnt see her !! 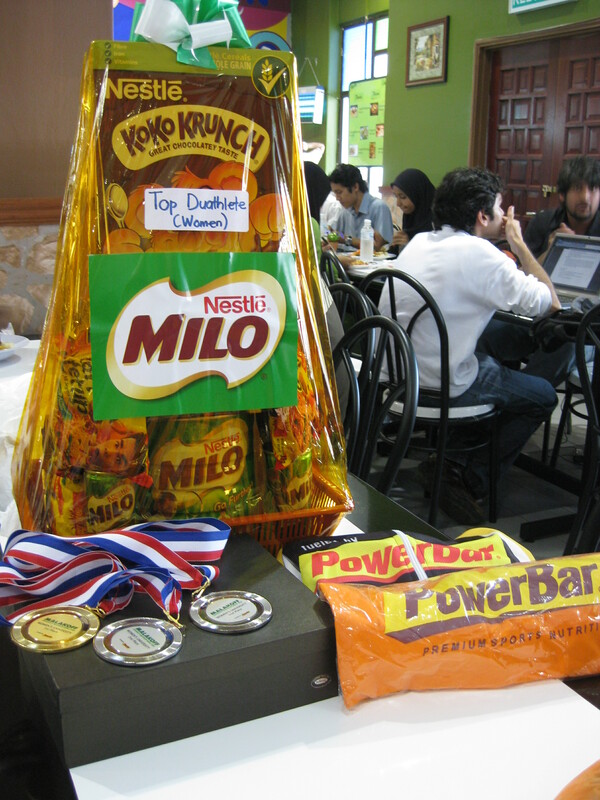 if not just a lil bit more effort and struggle to overtake her.. or case 2 :.. wah, i actually beat her time and position! .. either case, you really gotta train to see results.. plus , you gotta take extra care for your body and health, food etc to ensure you start and finish your race without any probs.. you know what i mean..sakit perut la, this lah, that lah.. i know we never know, but thats the whole point of preparing and ensuring that the preparation is a good one.. to lessen the risk of cutting the race short, or avoiding that DNF ! If you’re already in the triathlon scene, i guess you know what i mean lah.. guys are also struggling to catch up with Steph’s time !! So,apa2 pun, Steph, hats off to you ! I beat your KLIM time last year, itu pon, pasal ko takde training kan..ahahha.. and oso, KL Tower i was a mere 7 seconds behind you ! that was one race i really felt the sweetness of sweat and struggle..i was actually crawling up the stairs before level TH (tower head). Anyway, this is a motivation for myself to remain positive about things..of training, of targets, and of being discpline .. let’s just see where we get on from here. To all Malaysia ladies and lady athletes and sports enthusiast, hats off and applause to all of you for proving to yourselves that you can ! we can ! I love people who dare to be diifferent, respect those who sacrifice their time and energy to train to race ! Let the love for sports bind us all. We must admit, Malaysian ladies in majority, are not keen in trying new things.. for those who’ve placed 1 foot in runs and marathons, can any time put another foot in duathlon, triathlon and also adventure race.. we are simply 1 diverse community who don’t mind trying new things.. that’s the fun part yeah. And the fact that MUDS is organized this year, university students are given the opportunity to check the out duathlon… ! so all uni students , congratulations to all ! I met many new friends from various institutions. Nice to meet all of you ! 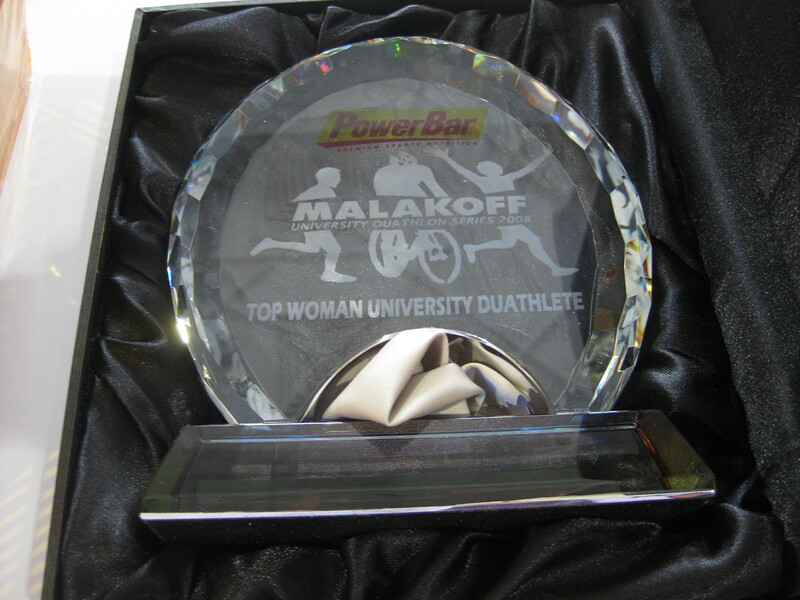 Oh yeah, UTM and UPNM actually have their own blogs for their duathlon and triathlon teams . How cool ! Check out my blogroll for their links! Keep the effort to promote this sports going and any other sports for that matter ! Sports is the edge for mainting a healthy and fun life! And there’s never a limit to the number of races you can take part in a year..simply so many to choose from ! See, its soo fun !!! * pictures courtesy of neobike, Farid and Fadiah. Thanks ! nice riding with you last nite at putrajaya…you are one fast girl…hardly kept up with you. I think if you keep on training…can win chok…! nice 2ride with u oso !!! :)me fast ? hehehe… banyak lagi hafta improve la my friend ! but u know,i luv2climb.. thats where the challenge comes.. and the planning ahead when to push2d max, when to chill and oso how to distribute ur energy throughout the ride.. thanks for the comment yip. oh,i added ur link to my blogroll.. check it out..
Greets! Really amazing. Big ups!